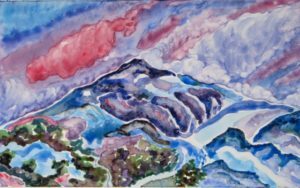 In the Moment, a show presented by Golden Gate Artists will be showing from November 6, 2018-January 6, 2019. Gallery hours are Monday-Friday, 9:30am-1:30pm. Golden Gate Artists initially formed more than a dozen years ago when local watercolor artists studying at the Sharon Art Center in Golden Gate Park decided to gather once a week to paint “plein aire” (outside in nature) throughout the city.